Reeves, R. and E.d. Mitchell. "Whale". 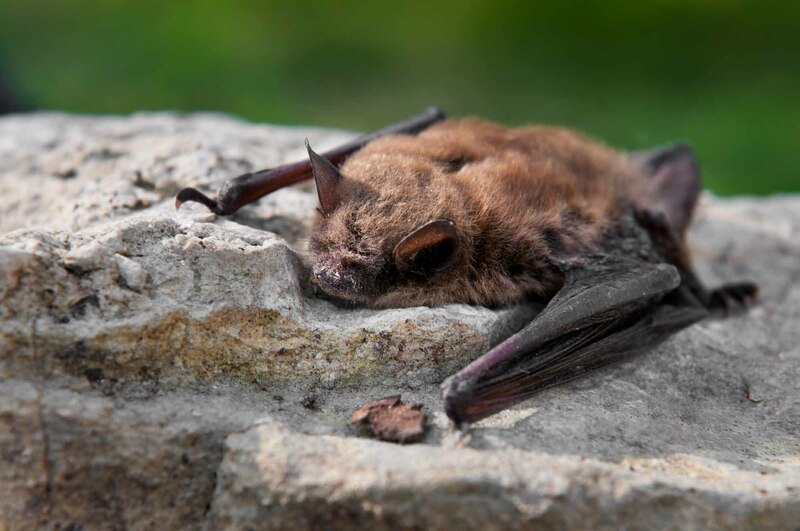 The Canadian Encyclopedia, 22 June 2016, Historica Canada. https://www.thecanadianencyclopedia.ca/en/article/whale. Accessed 24 April 2019. Whale, common name for large, aquatic or marine mammals of order Cetacea, which inhabit all oceans. 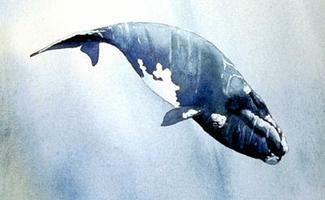 The right whale was the first whale species commercially exploited and it was almost driven to extinction (artwork by Heather Caldwell). The humpback whale is known for its haunting song (Corel Professional Photos). 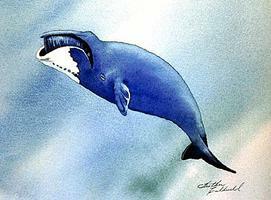 Over exploitation of the bowhead whale led to measures to protect it in 1937 (artwork by Heather Caldwell). Whale, common name for large, aquatic or marine mammals of order Cetacea, which inhabit all oceans. Whales range from about 30 kg for some of the smaller dolphins to over 150 t for the blue whale. Whales belong to 2 suborders: Mysticeti, baleen or toothless whales; and Odontoceti, toothed whales (smaller kinds of which are called dolphins or porpoises). Canadian waters are rich in whale fauna (8 species of mysticetes, about 25 species of odontocetes), and the commercial search for these animals was significant in early exploration (see Whaling). Because of overexploitation, several species are rare, eg, bowhead (Balaena mysticetus), an arctic mysticete; right whale (Eubalaena glacialis), a temperate zone mysticete; and blue whale (Balaenoptera musculus), largest animal ever known. The grey whale (Eschrichtius robustus) was extirpated in the N Atlantic and depleted in the N Pacific. Today, however, its migration along the N American Pacific coast is one of the world's great wildlife spectacles. The cosmopolitan sperm whale (Physeter catodon), the largest odontocete, preys mainly on squid and usually remains in deep water. 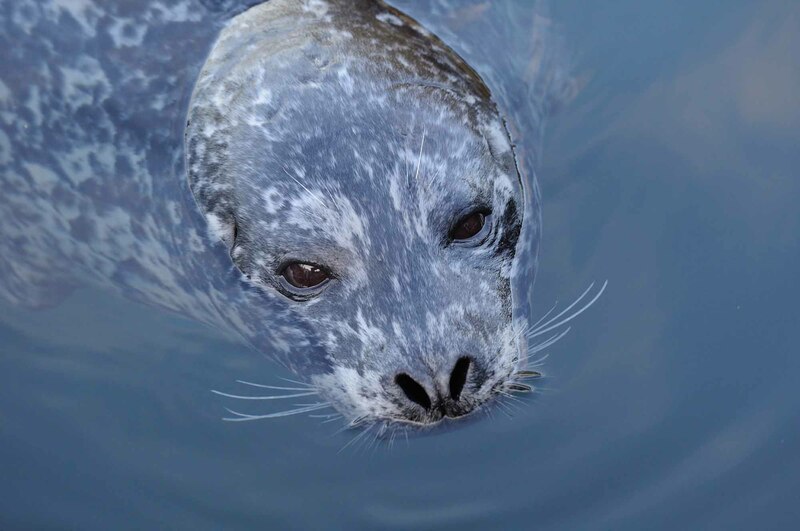 Adult bulls seasonally visit high latitudes; females and young remain in temperate or tropical waters. The beaked whales (family Ziphiidae) are rare in coastal areas, but Baird's beaked whale (Berardius bairdii) off the BC coast, and the northern bottlenose (Hyperoodon ampullatus) off NS, have been hunted by shore-based whalers. Since the 1972 moratorium on commercial whaling in Canada, whale watching has become popular. Several species, especially beluga, fin and minke whales (Delphinapterus leucas, Balaenoptera physalus, B. acutorostrata, respectively) and blue whales occur along the N shore of the St Lawrence River estuary. Pilot (Globicephala melaena), humpback and fin whales are the main attractions off Newfoundland; right, fin and humpback whales in lower Bay of Fundy; killer whales (Orcinus orca), humpback (Megaptera novaeangliae) and grey whales off BC. 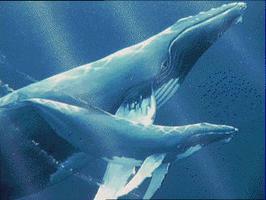 The humpback whale is known for its haunting "song". THE B.C. 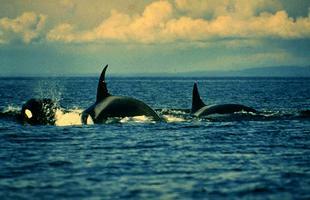 CETACEAN SIGHTING NETWORKThis site is dedicated to increasing public awareness of B.C. 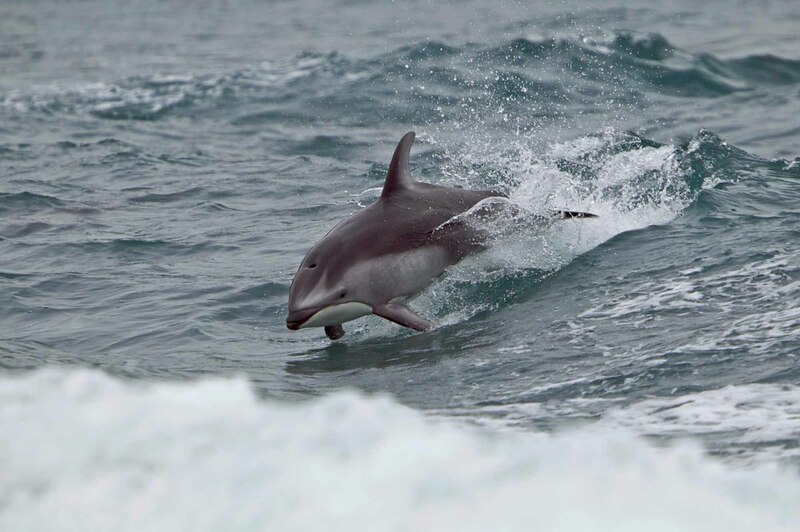 cetaceans and the conservation concerns affecting them. Track and listen to whales in B.C. waters.